:: Once Upon a Time board game (check it out here). We bought this game for Amity last Christmas & with the wet weather we've had recently we have been playing a few board games with the kids - this is our favourite at the moment. It's a fantastic game based on the traditional fairy tales, that is quite funny but also very good for their reading skills. I think this game is going to get played a lot! :: Red shoes. For me & my girls. 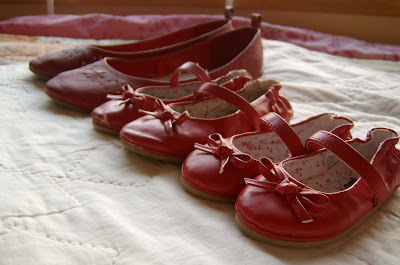 We love our red shoes & have been wearing them a fair bit recently! :: Chocolate Chip Hot Cross Buns. Toasted, with lots of butter.........mmm. Need i say anymore? I love chocolate & i love easter. :: Trinny & Susannah's Australian Makeover Mission. I've been a fan of Trinny & Suz for a while & i'm really enjoying this latest series, featuring lucky Aussie women getting a style-over from them! :: Lovely Sweet William Prints. I was lucky enough to win the print pictured below recently, isn't it awesome? I can't wait to get a nice frame & some matting for it & hang it in the girl's room (too babyish for Chas apparently). Lovely Sweet William also have lots of other delightful prints & i've got my eye on a few more in their etsy store. :: Country Style magazine. I'm a bit of a magazine addict & this one is fast becoming one of my favourites. I love flicking through it ohhh-ing & ahhh-ing over the beautiful country homes it features.........adding more & more to my 'oneday' wishlist. :: My Place. Actually we have been huge fans of this series since last year, Amity was always glued to the tv when it was on. 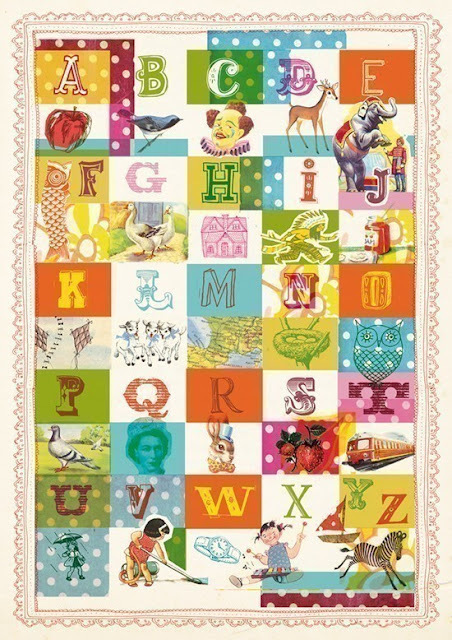 The book was a favourite of mine when i was a kid & a few years ago i found a copy of one in an op-shop to put away for the kids when they were older - then when i discovered that the ABC made the book into a series i was ecstatic! We all enjoyed watching it so much, that we went & bought the entire series on dvd..............and it's been watched & watched over & over again (not just by the kids, hehe). It tells the story of the children who have all lived in the same 130 year old house, beginning in 1888 & finishing in 2008. My favourite episodes are 1928, 38, 48 & 58...........ohhh the props they use! Beautiful old quilts & blankets, brass beds & the clothes! Oh my gosh the clothes! Perfect series for a history buff like me. :: Natural light photography. I have been so slack & really need to get some portraits done of the kids, especially since we've hard Scarlett (oops). I'd really love to have some professional natural light photos done, i really like the style of these two photographers - Nicole Finlayson & Clair Bremner. I hope you enjoyed some of our favourite things. my place ... NEED to find that NOW.